It has been a long time since I heard from you. What is the news there? I hear that Kuttachettan is much better now. How is he? The physician here is preparing some tablets, which will be ready in a couple of days, and I shall send them over. Do try them. I shall send more, if they make him better. Hope you are not feeling weak. Ammini Chechi has been writing to me. Only Chittamma does not write. Not even Unni is willing to write a line. Hope Ammini Oppa is well, too. Do tell sister-in-law and children that I asked after them. Is Kuttammaman fine? How is the new Diwan? Have the prices gone up much in our place? Has famine spread among the poor, after the recent storm? What else is news? I am doing all right here. My body does not feel weak, as there has been no fever or anything else. Yet, I haven’t put on weight either. Has Aniyettan been writing to you? Hope he’s doing fine. Please tell Kuttachettan that I enquired about him. Also tell him that I will send the medicine in two days. Hope Bhaskarettan is well, too, and please ask him to send me an occasional letter. Amma, do write to me about all the goings-on. I was living in a different hostel this year, and shifted to this place only day before yesterday. Now I am at the place where I used to live earlier. A nephew of the husband of Kanakam is also with me. Have Kanakam and Thankam returned from Ernakulam? Hope everything is fine with them. Has Bhai-chechi started her ‘Bhajan’? What’s the news about that lady? Is she very weak because of pregnancy? If only I could see her now. Her walking around pregnant makes me very happy. 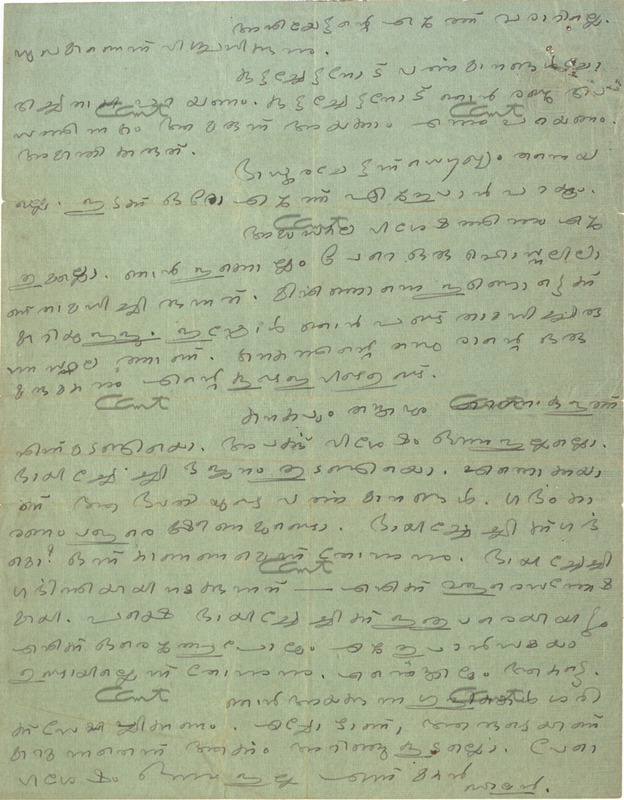 Yet it seems Bhai-chechi could not find time as yet, to write even a single letter to me. Whatever it be. Do make them take the tablets I send promptly. Nobody can tell whose medicine will cure, and when. Nothing else to convey. 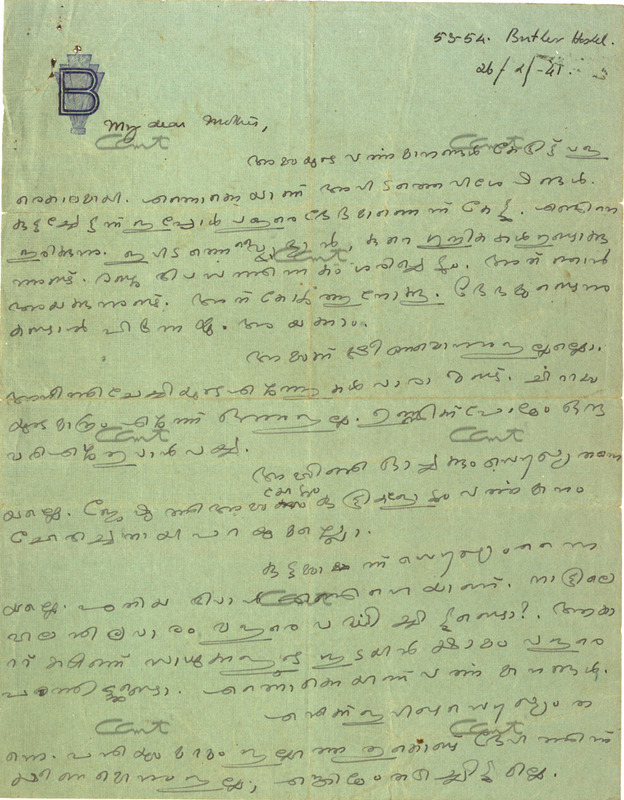 Note: This is the oldest letter from Swami Chinmayananda that is available in the Archives. He was 25 then.